Whether you are dealing with senior parents that need some help or something for yourself, finding elderly bathroom aids has got much easier. You can get frames that fit on either side of the toilet to help with balance, but if you have a small bathroom and space is at a premium then simply raising the toilet seat a little higher might be the answer. There are all kinds of affordable gadgets on the market now that can help with these things. You don’t need to replace the toilet for a specialty one, simply look at the additions that can be added to the present bathroom to help with their own personal care and make them feel confident. As the population ages, especially the baby boomers who make up a large segment, coming up with aids to be able to stay in homes and stay independent longer is very important. I know my dad battled Multiple Sclerosis and he did not want to leave his home, so after lots of research I didn’t realize just how many products have become available to help keep him safe. an affordable way to raise the height. It is nice when these products can be worked right into the home such as with grab handles and bars that help to prevent falls. The house my hubby and I bought was owned by a 100 year old man before he finally made the decision to go to a senior’s residence and this home had a few additions such as shower grab rails and an extra handrail down the stairs that helped him stay independent longer. At first hubby wanted to take them out, but I find them useful and I am not a senior yet, so they are staying! I think these should be standard practice when building a house. Anyone can easily slip in a bathtub, not just seniors. Well placed handles that are screwed right into the studs behind the tiles will hold you if you need to balance and especially when trying to raise yourself from the tub. Many seniors will accidently grab the towel rail when getting out of a shower/tub (my dad did this) and of course they were not designed to carry more than towel weight and so this can cause a fall as they may pull from the wall. They are an affordable addition to a home. It will make the difference for independence to many people as well as the elderly. They don’t get in the way, and they are not ugly. As we renovate our bathroom I told hubby I want them to stay. I feel these should be in every tub no matter what age. If getting in and out of the tub for a shower is an issue, but the idea of a major renovation is not in the books, then take a look at these transfer benches. They are rust proof and don’t slide around and will grip in the tub and are adjustable. You can sit on one end and basically slide into the tub and shower area without having to step in unaided. 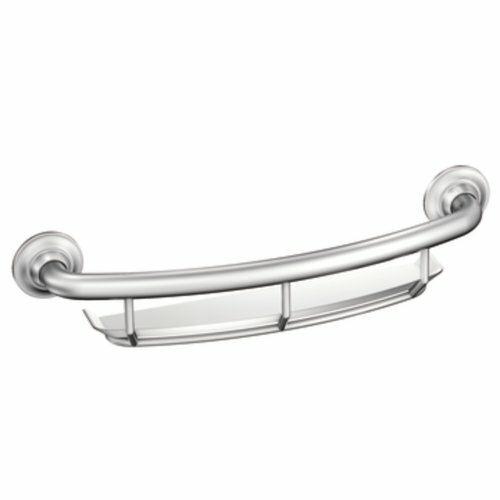 Since then shower grab bars were installed. There is usually one bar for when you get out making it easier, and then another one is installed just above the central soap dish for raising yourself from sitting in the tub. They are tied right into the stud walls so they are sturdy. Adding a good non slip mat or surface to the bottom of the tub will help too. You don’t want seniors to start losing their confidence in the bathroom. 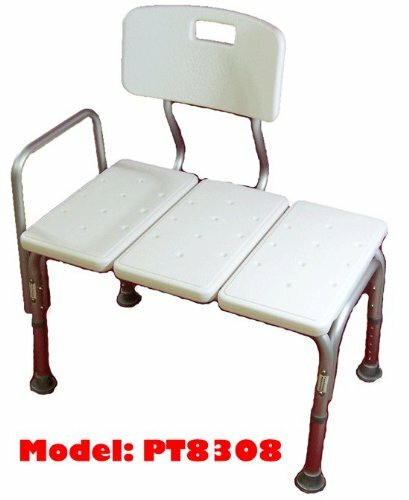 These elderly bathroom aids are helpful and give them the confidence they need to take care of their own personal needs for much longer. There are many aids and helpful tools on the market now designed to help you or your senior stay independent without having a costly bathroom renovation. Try to keep things as handy and as accessible as possible such as with a bathtub tray that could hold their soap, clothes, shampoo and more. This way they are not reaching for things and losing their balance. Another option is to have a storage rack on the back of the bathroom door with most used items at medium height so that they are not bending down or squatting to get things from the cabinet under the sink. My dad would do this and then get dizzy as he stood up, so if there is something that needs to be used often, then it needs to be accessible. If you have the room on the vanity then a simple dollar store basket that holds lotions and other products works and keeps the area clean, but if space is at a premium then a back of the door storage system will work too. Medicines should not be kept in the bathroom medicine cabinet because of steam and humidity from the shower can affect them and many seniors find the medicine cabinet hard to get into. So keeping their products they use every day in plain sight helps. Try to find ways to help them in the bathroom so that they are not bending down or squatting to find things in lower areas, or they may have a dizzy spell if they stand too quickly. So, try to envision everything at a height that will be comfortable and easy for them to grab.